For those in wet and windy Vancouver this blog about our windy and rainy day is for you. It began with 4 rain storms overnight, each gusting to around 25 knots. The sound of the wind humming in the rigging and the rain pounding on the deck was enough to wake me each time. I'm still not totally confident with our anchoring, though we've held firm through everything so far, so each time I wake I'm up looking around to make sure we haven't dragged. And did I say it was rolly? Nearly ear to ear, or at least that's what it felt like. Another storm passed through about mid-morning though this one was short. And the wind feels so much less threatening in daylight. Later in the afternoon we had one of the longest rain showers I've seen since Tomas. But no wind this time. 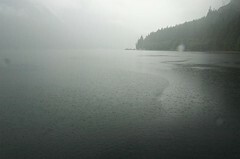 It reminded me a little of the day we spent up Indian Arm a couple years ago where it calmly rained for most of the morning. The water flat and quiet except for the hiss and patterns made by the rain drops. This time it must have rained steadily for a little over an hour. I was on shore shopping with the boys so we found shelter near the dinghy dock. The boys did what boys do and spent the time playing in the puddles and in the rain pouring off the roof. Several stray dogs, locals on motor bikes and scooters and some other sailors (feeding the dogs) were also all waiting for the rain to end. Pretty much everything that isn't done by car/truck on this sleepy island stopped and waited for the rain. The sun returned and along with it the wind. We zip back across the anchorage with our shopping and jump back onto our still rolling boat. Fed up with all this motion we decide to move back to the other side of the bay where we had anchored the last time we were here. Thankfully anchoring is much, much easier in this boat than our last one. Fifteen minutes later we're all smiles and settled into our new, much flatter, spot. Nearly exactly where we anchored the last time. And just in time too. The next wave of wind and water started to fall just as we were backing down on the anchor to make sure it was well set. Nothing like 2500 rpms in reverse plus 20 knot gusts to ensure you're well dug in. A couple more waves pass through but with enough of a gap in between that we manage to fit in a pleasant and tasty cockpit dinner (though we had to sit on towels as the seats hadn't dried yet).